How many times a day do you reference the sun? At sunrise? Sunset? On a long-awaited sunny day? When you are applying sunblock? While enjoying a warm sunbeam streaming through a window? Reading by sunlight, instead of a lamp? Reaching for your sunglasses? But have you ever referred to the sun as a crop? Probably not… but you may, soon! In states across the country leases for utility scale or community solar projects are helping farmers diversify their income from their land. Community solar projects in most states average 2MW (megawatts) or less in size. A 2MW community solar array is comprised of approximately 7,000 solar panels affixed on pilings that are “planted” on the acreage, then connected to the nearby utility grid. The energy generated is enough to power 400 to 500 homes or five to six schools, depending on their size. Solar developers and property owners typically agree to an up to 35-year lease, with payments higher than typical cash rent payments for crops. At the end of the lease (including any renewal terms), the developer will remove the solar system and return the acreage to a state suitable for its original use. 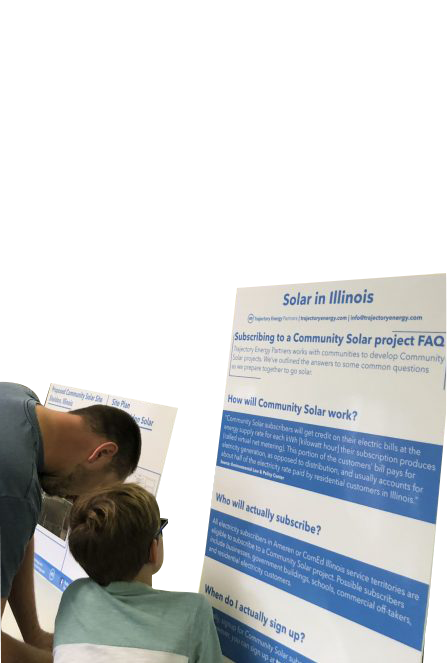 Community solar opens up access to homeowners, businesses and organizations that can’t install solar on their roof or property. Instead, they can participate in a community solar project via a subscription, and be credited for the energy produced by their share of the solar installation. Trajectory Energy Partners, a Midwest-based solar developer, uses a landscape-integrated design. It encourages the planting of pollinator-friendly ground cover under the solar panels and seeks marginal, subprime, less productive or “awkwardly located” ground for projects. (By “awkwardly located,” think of a plot of ground that’s being farmed on the edge of town, with development all around and farm equipment competing with traffic). Site lease agreement between landowner and developer. Community engagement to educate community and neighbors. Full interconnection analysis and design with utility. Zoning and permitting applications and approvals. Engineering and design of landscape-integrated community solar installations. Application for renewable energy credits or other incentives. As a lifelong farm resident and former state director for USDA Rural Development, I view community solar as an opportunity for community development in our rural areas. Producers have a chance to guarantee an income on a portion of their land for more than three decades—that may mean the difference in bringing the next generation into the operation, or keeping him or her there. It means another family contributing to the community. It could also mean the difference in getting an off-farm job to sustain the farm and/or pay for health insurance coverage. The increase in the property tax will benefit area schools, libraries and infrastructure. There are no “rainy day” funds anymore in our rural communities. Applying for grants oftentimes requires matching funds. More available tax dollars could help meet that match. How many rural municipalities and cemetery districts have available land that is suitable for the consideration of planting a new crop? Yes, Planning for the future may mean “planting” solar panels for the future to harvest a new crop… the sun!